At JOB Heating & Air Conditioning, Saskatoon we are eager to provide the best possible customer experience, our aim is to be a professional resource for our clients before, during and after the sale! Our team takes pride in our service knowledge in regards to modern industry equipment and training. We are recognized by peers and offer service training & installations for residential, commercial and industrial. Jeff Bolton joined JOB Heating and Air Conditioning as a partner in 2014. Jeff began his career in 1989 with Westburne, a plumbing and heating wholesaler. Over the years he worked his way up through the ranks this was sue in part to his keen interest in plumbing and heating products. Jeff specialized in hydronic heating systems, and he spent many years designing, selling and repairing hydronic heating systems. When he was invited to become a partner at JOB, he jumped at the opportunity to work with such a well respected local company. With many years of plumbing and heating under his belt, he embraced the role whole heartedly. Jeff has a clear vision, a commitment to always putting the customer and his community first. Spending many years as a volunteer, serving the communities greatest needs has given him the right balance of drive and determination to always do the right thing. JOB Heating & Air Conditioning were nominated and subsequently passed the verification process to be Trusted Saskatoon air conditioning, furnace, and plumbing contractors. This means that we are contracted to uphold the 5 TRUSTED GUARANTEES by a third party company that works for the public, and we have been recognized for five years for our integrity and our outstanding customer service. Provide the service and quality promised. Complete the job on time. Charge the price quoted with NO surprises. Communicate honestly and be responsive to customer needs. Resolve any issues with customer satisfaction in mind. JOB is fully licensed and bonded for installations, repairs, and maintenance of gas, refrigeration, sheet metal, and boilers. We are members of SaskEnergy Network, the Saskatoon Chamber of Commerce, and Saskatoon & Region Home Builders’ Association and we are Independent Lennox Dealers. JOB Heating & Air Conditioning is proud to have been the recipient of the Saskatchewan Workers Compensation Board Merit Rebate Awards in recognition of our excellent safety record. JOB has an A+ Rating with the Better Business Bureau of Saskatchewan. 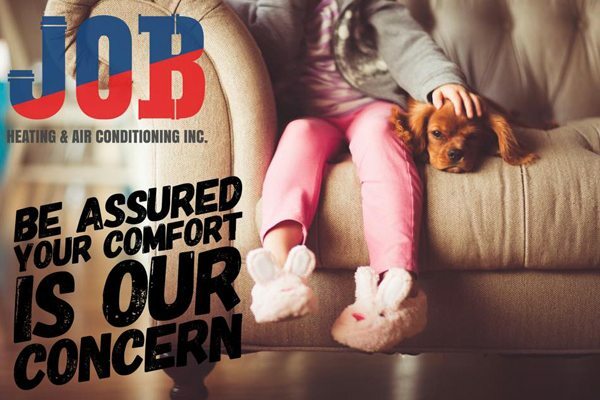 At JOB Heating & Air Conditioning we have multi-ticketed tradespeople and can help you with your furnace, water heater, boiler, in-floor heating, gas lines, air conditioning and more.